One of Impact's main goals from the start was to enable game developers to build games for a multitude of different platforms. Starting today, Impact is officially supporting an exciting new platform: Wii U™. Nintendo did a tremendous job with their HTML5 development environment Nintendo Web Framework. It provides a high performance Canvas implementation and excellent sound support. While Impact runs "out of the box" on the Nintendo Web Framework, I developed a Plugin for Impact in cooperation with Nintendo. This Plugin makes it a snap to seamlessly integrate Wii U GamePad and its second screen, Wii Remote controllers and various other controllers in your Impact game. The Impact NWF Plugin and a modified version of the Super Generic Jump'n'Run demo game showcasing its use is available on the Nintendo developer support website. The Plugin itself is free to use and just needs the Impact library files from your download page to run. If you don't have an Impact license yet, you can buy one here. To develop for Wii U, you will need to become a Nintendo Authorized Developer and obtain a Wii U development kit. You can apply to become an authorized developer over at wiiu-developers.nintendo.com. 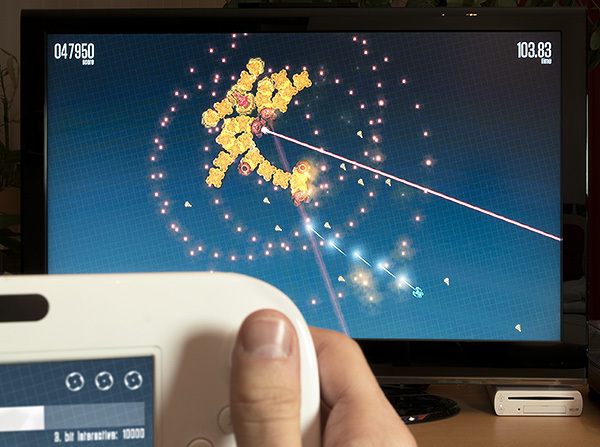 My own Impact game X-Type running with Nintendo Web Framework on Wii U — Couch Mode Activated! Playing your Impact game on the living room TV is a whole new experience. I'm excited to see what you're coming up with and hope to see a lot of your games on the Nintendo eShop in the future!